Dovahkiin is pronounced Dover-keen. I'm getting used to it now but generally just call her Dover. She is still not fully integrated with my original flock but now has four new companions and she's getting on really well with them and they all share a run. 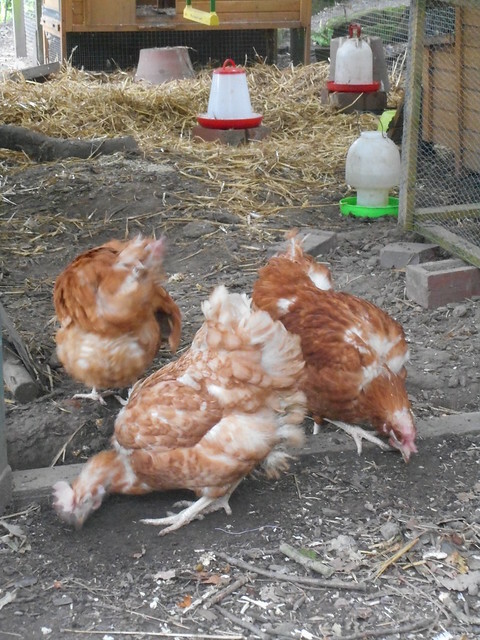 The four new ladies came last Sunday from a BHWT rescue and are totally charming. I've never had so little trouble with new girls and because they don't bother too much when the 'big' girls have a little rumble all turns harmonious pretty quickly. They have been named by one of my daughters, her boyfriend and my twin granddaughters. Once again I'm having to remember strange names....... Saphira (from Eragon) and Khaleesi (from Game of Thrones)........... but at least I can get to grips with Audrey and Strawberry. I don't know if they brought mites with them or it is a horrible coincidence but my halcyon mite free days are now over and the bonfire, blowtorch, Poultry Shield and Diatom have been out in force today. I haven't seen any sign of the chickens being bothered but I was getting gazillions of little beasties running around my arms when I touched one of the coops. I foresee a battle ahead! So I'm now up to 16 ladies. More than I ever intended, but there was a local rescue, and I had space, and ............ the rest is history. 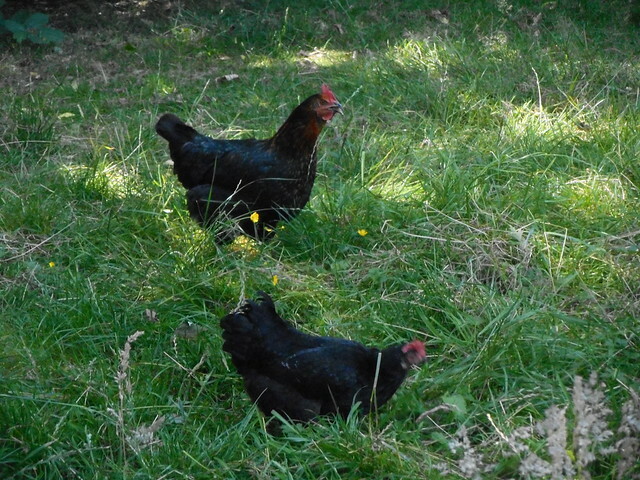 So, current residents: Portia - queen of all she surveys and came from a BHWT rescue in March 2013: Florence, Esmeralda and Tessa, bought at point of lay in March 2014: Little Black Hen, moved in from next door in August 2014: Heather, Chestnut, Astrid, Lucy, Roxy and Olive - BHWT rescue in Oct 2014: Dovahkiin, rehomed with us in July 2015: and now the ex barn hens Strawberry, Audrey, Saphira and Khaleesi. Dover looks just like my Remie who is a Black Star, is that the same as a Black Rock? We love to hear about new girls - but PICS PLEASE!!! Preferably with Portia supervising closely, and the Official Ball Checking Chicken doing the headcount. 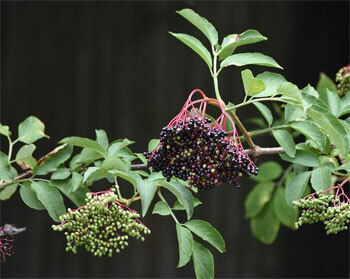 I bet Black Rock and Black Star are the same - breeders seem to love making up their own names for various crosses. Dovah evidently had a Rhode Island Red dad and a Barred Plymouth Rock mum. 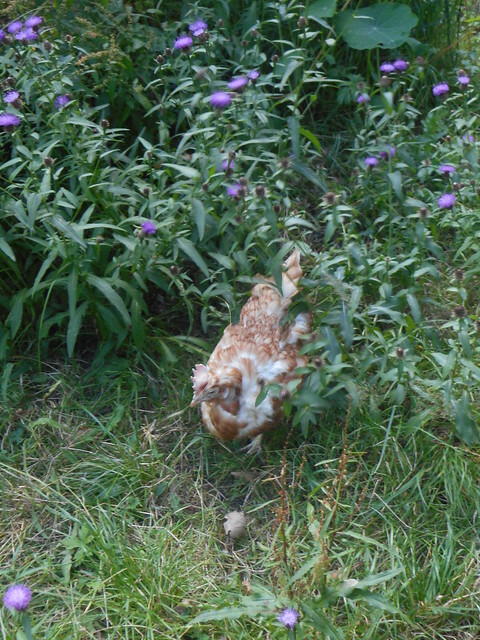 Here she is out with the little black bantam who has about a million different names. And here are the new girls on their first afternoon. 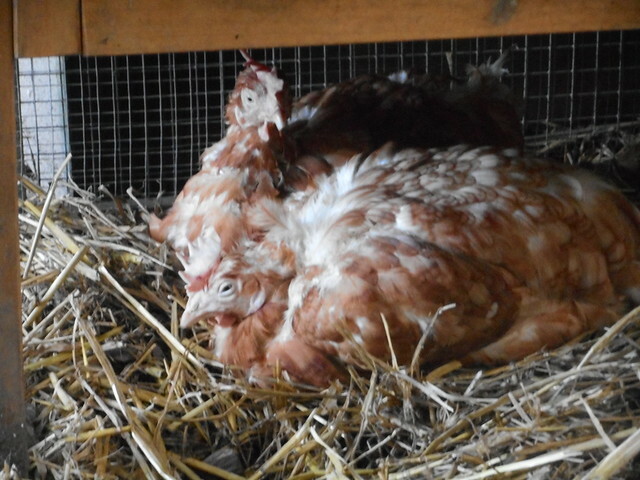 Three very tired hens and one totally, totally exhausted hen (Saphira). Evidently they hadn't been fed for a day or two as they were destined for slaughter, so add that to a stressful morning and its amazing how well they cope. But they were so tired. Stawberry - still looking around and wondering where she was, and Audrey - too tired to care. Saphira's first steps outside a cage, Audrey crossing the threshold and Strawberry not realising the momentousness of the occasion. Khaleesi didn't need a second invite - she headed off to check out the neighbourhood. As for Tessa, the official ball checking chicken, she was organising a break out into the neighbour's garden with Lucy and Roxi and wasn't available for headcounts. lovely photos! really heartwarming seeing those dear girlies exploring your garden. It makes me want to get some more ex bats myself, but I must resist....so hard! I know I sound daft but these 4 girls seem really special and I am extra pleased to watch them exploring in the great outdoors. They have totally changed the dynamic of the whole flock and pulled everyone together. Resistance is useless Kitla! I have always intended to keep 6 chickens. No idea where the other 10 came from! Sometimes it is just easier to go with the universe! Aw they look so sad and dejected bless them when they first arrive, cant believe its nearly 2 and a half years since we got both our ex batties at the same time, hens may not but time sure does fly. Lovely photos and essential because of course when they are following you around and being naughty girls you cant believe how fragile they were before. 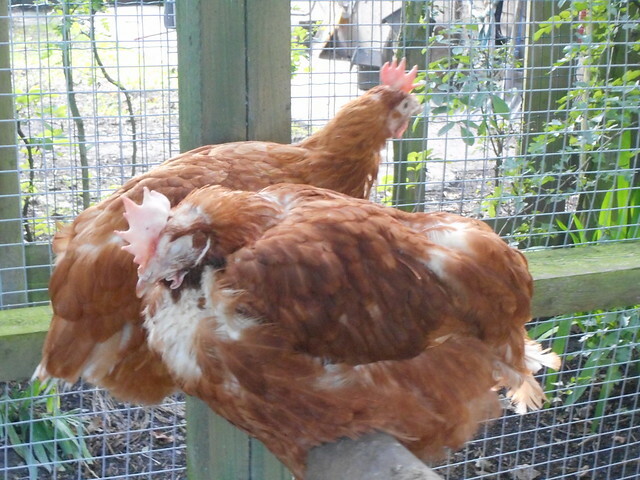 I have had 2 lots of ex free range since the batties but must rehome those special girls again next time. Now Bridget no dallying as in the past I will want to follow those precious girls new adventurous and love filled life. Oh dear. Lots of dallying. I don't know where the time has gone. 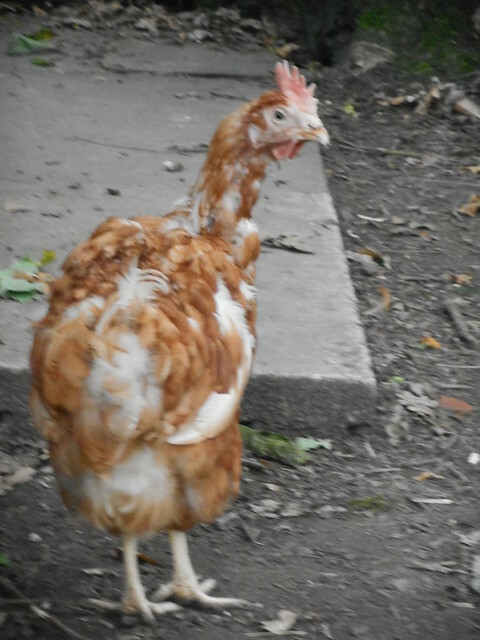 Very sadly I have to report a few losses - Portia, my precious queen chicken died at Christmas. She did it very well though - was her usual impudent self one day, a bit subdued the next and died the next. If you've got to go then that's the way to do it. Chestnut followed her over Rainbow Bridge just a couple of days later and Florence about a month ago. Losing Florence was unexpected - she was only 30 months and had had a decent life. She was very vocal and had quite a husky voice so her absence is very noticeable. Her sister Esmeralda and Dovah have become best friends now though - it would have been hard on Es otherwise. So I'm down to 13 ladies. The little black bantam is broody once again (it's her life's work) so we're not seeing much of her at the moment. Khaleesi has become the new escaping chicken and wanders ever further. I now lock the 12 good girls up in the evening and then have to go out of the back garden and walk along the edge of a field behind other gardens, while making my ridiculous chicken calling noise. Sooner or later I'll hear a little murmur and after a few more plaintive bleats from me Khaleesi will emerge from the undergrowth and trot home quite happily. The neighbours haven't said anything - yet. She hasn't been out for the last couple of days so maybe I have blocked her escape route. It's hard as there are lots of shrubs and branches that she can hop up on. Maybe once she can come into the 'gardened' bit of the garden again she will be happy. Our newest dog is finally to be trusted with the chickens but we have a 4 month old puppy staying with us too so dogs and chickens are separated once more. I still take the other dogs into chicken zone every day to keep them used to them but the chickens are so mean to them - nasty pecks on innocent dog noses! I'm going to have a little catch up on all your diaries now. It's going to be a late night! So sorry to hear about Portia but as you say, she went with style and that's the way to do it. I daresay she hand-picked and trained her successor? 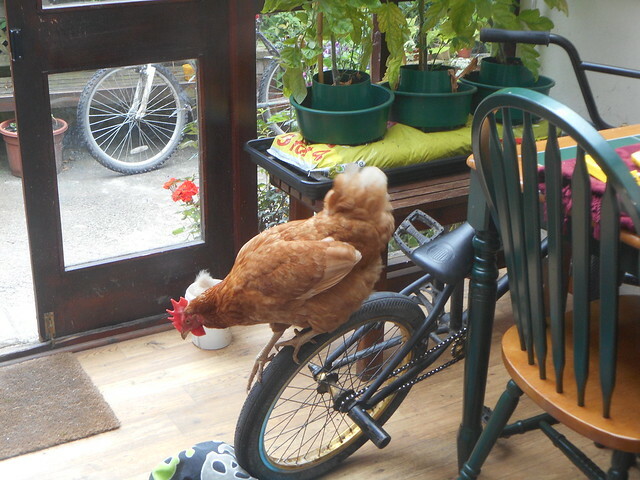 I hope the Official Ball Watching chicken is doing proper headcounts? It sounds as if her services are sorely needed with Khaleesoudini. Good to see an update!